Metal Painting Services | Quest-Tech Precision Inc.
Quest-Tech proudly offers industrial metal painting services for our customers. Our industrial painting services help guarantee that all metal products are prepared for specific painting applications and have the correct paint applied to meet the demands of specific environmental conditions. Metal painting gives any component or finished product an aesthetically pleasing appearance and adds to its market value. More importantly, this is one of the best methods to protect your metal products from the effects of any corrosive environments. Painting a metal surface helps to mitigate the atmospheric effects of moisture and oxygen that cause corrosion. Thus, painting provides a protective coating that defends the product’s surface from nearly any chemical reaction or physical contact. Our preparation procedures for painting services vary based on the type of metal, most commonly being aluminum painting and carbon steel painting. We first perform a chemical wash or sandblasting process, as appropriate, which helps make certain that painted parts come out with a quality and uniform finish. As an alternative service, Quest-Tech can provide chemical conversion of aluminum. This conversion provides chemical film passivation and further corrosion protection of aluminum components. 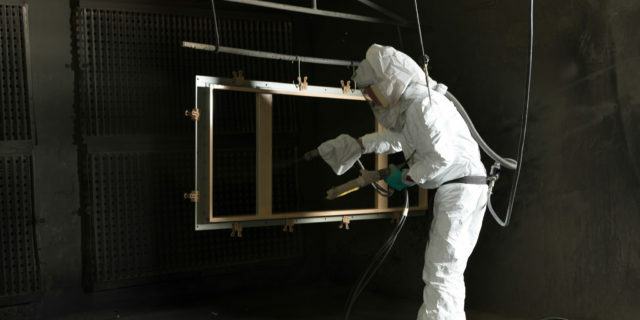 We thoroughly clean the material and then apply an iron phosphate spray mixture, placing a coating on the metal that enables adhesion and allows the paint to be applied evenly, passing all inspection cross-hatch adhesion tests with this application. Quest-Tech utilizes Ransburg Electrostatic paint guns to produce an even coat that can stand up to the toughest environments. Electrostatic spray coating is a technique that creates an electrical charge to propel paint particles onto a conductive metal surface to provide the client’s desired finish. Ransburg is one of the global leaders in the design of electrostatic products. Gema Powder Coating guns are used for those metal components that require dry finished coatings. The powder is applied electrostatically and cured under heat, creating a skin-like finish. Powder coating provides a durable, protective finish, has excellent performance properties, and has a limited environmental impact. Powder that does not adhere is collected and reused. Additionally, the powder coating is applied in a sealed environment where there is little risk of air pollution. Silkscreening is an option available for products after the painting process is completed. Quest-Tech employs silkscreen technology to apply text and graphics for branding, labeling, and for decorative purposes. We can provide small to large size ink silkscreening with a high resolution and quality finish. At Quest-Tech, our goal is to guarantee that your metal products are prepared for the demands of any environment as per your specifications. 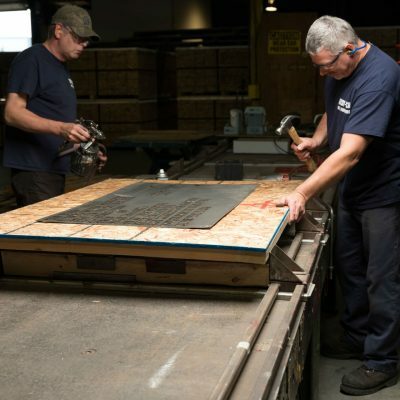 To learn more about our metal painting services, please contact our experienced team today.